The Costa Mar complex is only a 10 minutes walk to the beach. 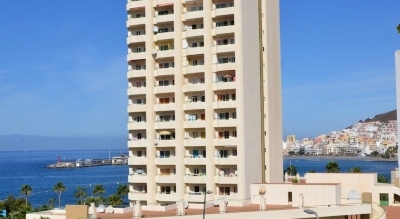 The complex overlooks the Los Cristianos port and many of the apartments have sea views. The complex boasts a 24 hour reception, lift to all floors, bar and lounge and a solarium with views of the yachts and boats and the Atlantic ocean. All of the apartments are bright and airy and include furnished balconies. The apartments are decorated in a simple style but functional, using warm Mediterranean colours. The units consist of a sitting room, private bathroom, kitchen area including a fridge and coffee maker. The Costa Mar apartments are situated in the centre of Los Cristianos, 500 metres from the Tourism Office, as well as various restaurants and friendly bars. It is very close to the Arona Gran Hotel. There is free private parking and wifi internet is available through reception for a small extra charge. Reception can also help with car and bicycle hire. Local bus stops are only a 5 minute walkaway and there are also regular ferries from Los Cristianos to the neighbouring islands of La Gomera and La Palma.